So to start with I drew up some sketches on paper. Then found this great trial software, Inventer Light from Autodesk, the AutoCad people. 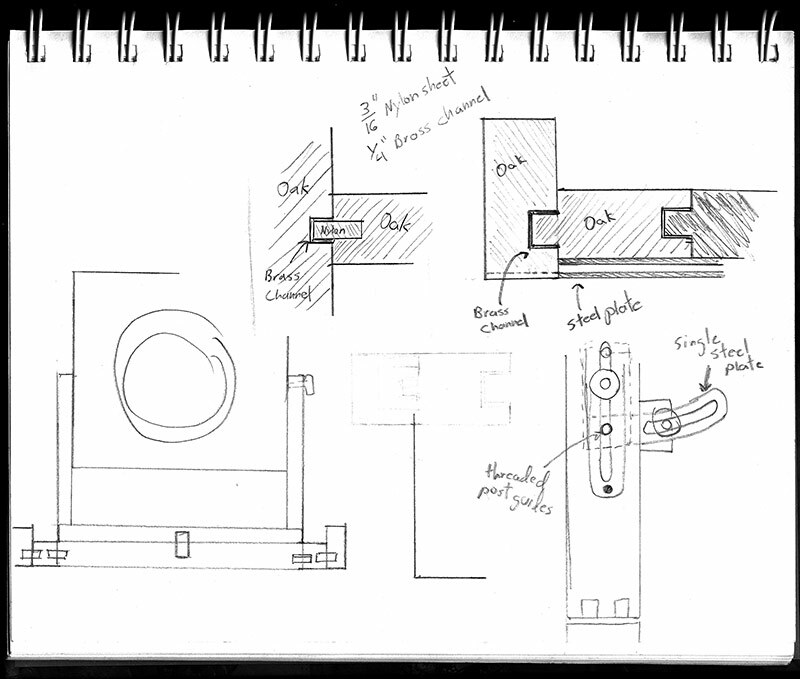 Those drawings will come later since I am figuring out some of the detailed mechanical parts with it. I decided I would build the camera out of Cherry and either Stainless steel or Aluminum. I am leaning toward aluminum because it is much lighter and once anodized will be quite strong and durable. To Start the Build, but why? 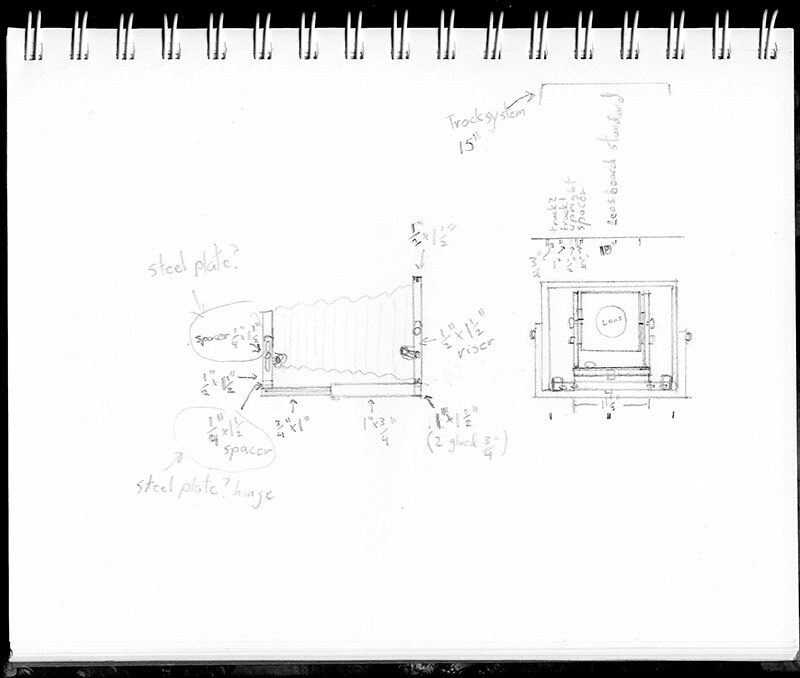 What I hope to do here is let you follow the progress and story of my attempt to build a 16-inch by 20 inch ultra large format field camera. I hope to add Project logs for other projects later, too, once I figure out the best way to present them. So why build such an enormous camera you might ask? I am crazy of course is the best answer, but in truth there are a couple sorta reasonable reasons for it. First, 16×20 is the ideal presentation size. Small enough to hang on any wall, but big enough to get all the detail and richness available in a good print. Of course enlarging a 4×5 negative 4x gives a 16×20 print, but a contact print of that size would blow an enlargement out of the water in terms of detail and tonality. Larger format film provides excellent range and tonality, giving a print a lot to work with, but in the end an enlarged print gives up some of that quality in exchange for a smaller negative and easier process. With a contact print very little of all that expensive and rich detail and tonality is lost resulting in the best print quality possible in a lot of ways. Another good reason for negatives that large is for use in alternative processes, like cyanotype, platinum, Van Dyke and Gum bichromate, among a few others. Alternative processes don’t used silver as their base photo sensitive material and are not very sensitive to much light besides UV light. The result is that you need a strong UV source like the Sun or a big bank of lights. No enlargers here. The only way to print with the sun is by contact printing. Photographers have develop ways of getting big negatives in the darkroom, but why not just go straight to film in camera? There are some great alternatives like digital negatives, but that requires a big printer and expensive printer film which has limited sizes. Digital offers more creative possibilities of course, but also has big limitations and is only applicable to alt processes. I looked around for a way to make big negs and found a few companies that would be happy to make one for me for the price of a small car, but nothing seemed reasonable, until I came across a page built around a group of camera builders. These were my type of people, and what they were doing didn’t seem out of my reach. So I decided to go for it. What will come is my trials and tribulations of building a ULF camera with my own design. Hopefully it will amuse you and maybe even provide some useful ideas about what to do and what not to do if anyone out there decides to build their own ULF camera. The privacy of our visitors to cameras.artedetimo.com is important to us. At cameras.artedetimo.com, we recognize that privacy of your personal information is important. Here is information on what types of personal information we receive and collect when you use and visit cameras.artedetimo.com, and how we safeguard your information. We never sell your personal information to third parties. We also use third party advertisements on cameras.artedetimo.com to support our site. Some of these advertisers may use technology such as cookies and web beacons when they advertise on our site, which will also send these advertisers (such as Google through the Google AdSense program) information including your IP address, your ISP , the browser you used to visit our site, and in some cases, whether you have Flash installed. This is generally used for geotargeting purposes or showing certain ads based on specific sites visited. You can chose to disable or selectively turn off our cookies or third-party cookies in your browser settings, or by managing preferences in your internet security software. However, this can affect how you are able to interact with our site as well as other websites. This could include the inability to login to services or programs, such as logging into accounts.